Built: 14th century or earlier. Notes: Esslemont Castle is a ruined tower house in Aberdeenshire, Scotland. It is located on the A920 west of Ellon. The castle is roofless and missing large sections of wall which were reused in building sites nearby. Especially noticeable are the missing dressed stones of the windows. The structure is a L Plan castle with a staircase turret and a round tower at the south east angle. 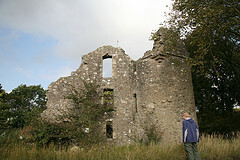 The main building seems on the ground floor to have contained the kitchen, with a wide fireplace in the north gable; the rugged edges of the ruined sides of the flue being visible high up in the gable. Though ruined, the remains are clearly on three stories. The Gordon Arms are visible on the exterior of the castle.